Hello there! My name is Vivian Lake and I want to share with you my latest project using the International Scrapbook Garden's toolshed kit: Colorburst. So far, I have made five pages with this kit and love them all. It is so full of masculine goodies that it is just brilliant for any boyish pages you want to make. The kit has lots of items from 49 and Market, Lindy's Stamp Gang, Creative Embellishments and 7 Dots Studio . . . you just can't go wrong. All supplies are listed at the end of my post. One of my son's last 5th grade projects was called "The Decades Project" and he was part of the 1910's and 20's group. The kids were encouraged to dress up according to the time period they represented. We just couldn't resist. My husband and son made an evening of it and bought a suit closely matching the time period. I found a hat on Amazon and well. . . . you can see the results. He shined at school all day, refusing to change. I think he secretly loved all the attention. This is also the same time of year that blue bonnets bloom here in Texas. Lots of moms were asking about getting photos of their kids and blue bonnets on FB. I bragged online saying . . . . "eat your heart out, blue bonnets". Even boys need to be taught to be comfortable with how they look and feel in their own skin. Without further ado, here it is. I hope my work inspires you. Thanks for stopping by today!!!! 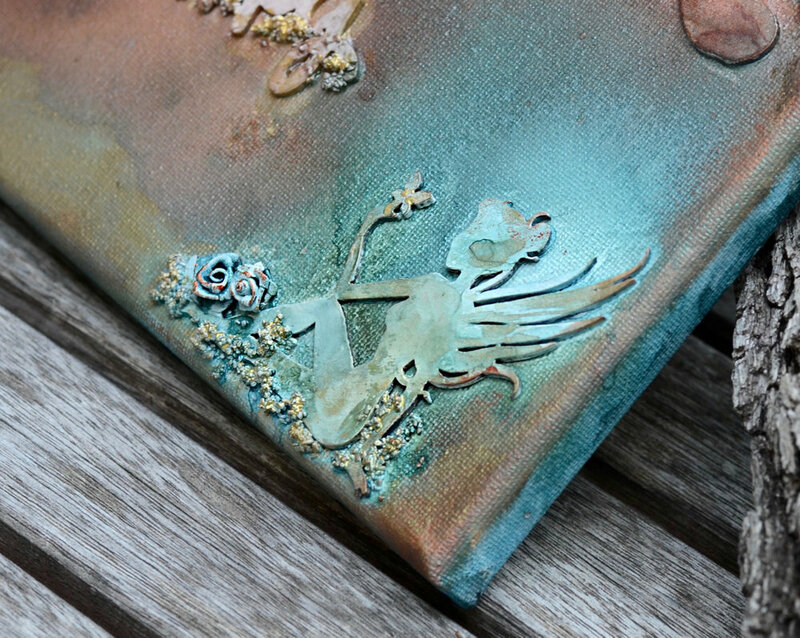 Most of this page is from the kit, the main exception is the Tim Holtz' metal embellishments. I love layering die cuts. Having a small cluster away from the main photo keeps your eye moving. I am learning that it is ok to add flowers to "boy" layouts. By adding the metal embellishments, I believe it helps the page retain it's masculine feel. Without the metal, I felt my page was just a bit too "flat" feeling. I layered tags and frames here. This is a great way to keep my stash from becoming overwhelming in my crafty space. I added black acrylic paint splatters at the end. My page looked "fine" without it, but the splatters give it that final mixed media touch we all love. The mixed media kit come with Paste-eez "Hold the Mustard". I lightly added this with my pinky finger all over the page. It really made the green and teal colors "pop" and added a brightness to my page, which otherwise felt rather dark. Hello! I'm Vivian Lake and I want to share with you my newest mixed media canvas. I absolutely love making these and apparently have started a theme throughout my house. I used a variety of supplies from International Scrapbook Garden, Lindy's Stamp Gang, and my own stash of various goodies. I could "describe" how I made this, but honestly I highly recommend you just watch YouTube videos by those who have taken them time to make them. You will learn a lot more than reading my words. I do love the Prima wax "Red Amber" that I used here. It really makes the texture of the canvas pop. I did learn from Gabrielle Pollaco to add bling at the very end. Her videos are very instructive and well done. Since the top of my canvas is so "heavy", I wanted to minimize the embellishments surrounding my fairy. Do you feel the wonderful mixture of emotions by her placement? Canvases are a great way to get your hands messy, relax your mind and really play with techniques and colors. As long as you understand the basic "rules" of applying gesso, sprays, inks, etc., you almost can't really mess up a canvas. The trick is having enough goodies to play with. To see the full list of supplies, please visit my blog. Hello! I'm Vivian Lake and I'm here to share with you a special layout about my sister. I'm using International Scrapbook Garden kits and supplies . . . 'Autumn Hayride'. I have tried to scrap my sister's wedding photos a couple times, but I have always felt that my pages didn't do justice to the photos. Not enough flowers, or something else was missing in the past. Anyway, I love how wonderfully mixed the Garden kits are and wanted to give it another go. I used a variety of techniques on my chipboards, including the use of the Red Amber wax. Did you know that the store has more to offer than just the kits? There are a variety of items including 6x6 paper pads and mixed media stuff for you to enjoy. Check it out!